The global advertising industry can be divided into two eras: “BS" and “AS". Or, to expand those initials, “Before Sorrell" and “After Sorrell". For the industry has changed unrecognizably over the past 30 years, and many people believe that is largely because of Sir Martin Sorrell, whom they credit (or blame, depending on their point of view) for the transformation. It all began exactly 30 years ago, on 27 June 1987, when the baby-faced, 42-year- old Sorrell made an audacious hostile takeover of J Walter Thompson Co. Llc (JWT). Having been the whiz-kid finance director of Saatchi and Saatchi Group Ltd, who had masterminded a series of headline-grabbing takeovers, making Saatchi the world’s largest advertising agency, Sorrell quit, supposedly in a pique. And industry watchers wondered what this supposed financial wizard would do next. What he did, rather puzzlingly, was to buy into an obscure little firm named Wire and Plastic Products (WPP) that made supermarket trollies (making one industry watcher exclaim: what a genius he is, he’s evidently spotted a hidden opportunity in advertising inside supermarkets). Over the next two years, Sorrell bought himself a clutch of small marketing services companies. And then he made his big move. JWT was one of the world’s largest advertising agencies. But, back then, it was in trouble, with a financial performance that stubbornly lagged behind industry norms. Then in early 1987, a boardroom drama took place that few people remember today: a 44-year-old rising JWT star named Joe O’Donnell attempted a coup against the company’s chairman Don Johnston, who had been his mentor and godfather. O’Donnell warned JWT’s board that the company’s dismal performance had made it a takeover target, and that the sharks were circling. But he had a way to fix the problem, he said: fire the chairman and, with the help of an investment bank, arrange a management buyout of the company, and take it private. O’Donnell’s plan backfired, and he was promptly sacked and disappeared into advertising oblivion. Industry pundits scoffed at O’Donnell’s warning, saying that a hostile takeover was impossible in advertising, because it was a people industry, and any corporate raid would only lead to an exodus of staff and clients, and the quick collapse of the agency. This was the ultimate poison-pill defence, they said. But, of course, O’Donnell was right. If JWT had indeed gone private back then, through a leveraged management buyout—and other major ad agencies had followed its example—the advertising industry today might have been a very different place today. Two months later, Sorrell stunned everybody by making a hostile bid for JWT. The agency scurried around to find itself a “white knight" to thwart him, but it was of no avail. And thus, on 27 June 1987, JWT, the grand old lady of advertising, was bought out by an upstart firm run by two young men out of a dingy London basement office, Sorrell and his then partner. It was like the plot of an improbable, B-grade Hollywood movie. Sorrell quickly disproved the belief that an advertising agency could never be the object of a hostile takeover. There were some initial rumblings within the agency’s ranks, and among its clients, but these were soon silenced. And within two years, Sorrell had pulled off the remarkable task of almost doubling JWT’s lagging profits to bring them in line with industry norms. He then embarked on his vision of turning advertising from the fragmented creative cottage industry that it was into an efficient global marketing machine, which he believed better reflected the growing global outlook of its clients. And this he did through a combination of hawk-eyed financial management and prolific dealmaking, combined with a marked appetite for micromanagement. The accusation of micromanagement is something Sorrell revels in, regarding it as a compliment rather than a criticism. His managers comment, with some awe, that he typically responds to emails within two minutes, regardless of what time it is. And, as the old joke goes, Sorrell probably had a BlackBerry chip implanted in himself. But the question is, how has the advertising industry changed in the post-Sorrell era? First, of course, what were just a number of “dinky little craft shops" (Sorrell’s description) have now become a consolidated, globalized industry: for example, the four major global advertising groups today account for 70% of the world’s advertising. That apart, the industry has shifted towards a more data-driven, more accountable orientation. It has separated its media business from its creative function, thus delivering greater value to clients. It has migrated dramatically from traditional media such as television and print to digital media. And most notably, it has ruthlessly cut costs, and become much leaner, meaner and machine-like. These have been the mega trends driving the industry in our times, and Sorrell has, with his vision and his business smarts, played a major role in shaping each of them. As Ranjan Kapur, a respected industry veteran (and currently country manager at WPP India), puts it, “In each case, Martin has shown astuteness and foresight in preparing WPP to be ahead of the curve." “Yes, ad agencies have become more productive and more efficient—but along the way they have had the life squeezed out of them." “Advertising has become commoditized, and data and metrics are valued above creativity and ideas." “There used to be two types of ad agencies , the “culture agency" and the “collateral agency". But now the entire industry seems to have become “collateral"—which has devalued it and impacted revenues big time." “The low-cost staff model has hurt the industry. Clients pay very low fees and no longer see the value-add. Talent is migrating out of advertising into other industries." “The overemphasis on profitability has pushed all ad agencies in the direction of sameness and blandness." “The ad agency has now been fragmented into a constellation of businesses." “The advertising agency is losing its relevance. Niche specialist communication skills have created unbreakable silos, and 360 degree communication solutions no longer exist." “There isn’t enough motivation to excel. As a result there are no great role models or icons in the industry today." “The fun of working in advertising has been abolished. Ask anyone." Sorrell shrugs off these criticisms. “The problem with our business is that people don’t take us seriously. They think advertising is a bit of an offshoot from show business," he once said. And getting rid of that perception has been one of his overriding objectives. His own benchmarks and role models therefore lie in the investment banks and consulting firms he admires, McKinsey Inc., Goldman Sachs Group Inc. and JPMorgan Chase and Co. Ultimately, it all seems to boil down to the issue that Sorrell, with his flair for coining the quotable quote, once called “Mad Men vs Maths Men". And it is probably encapsulated in his famous ongoing feud with another global advertising icon, Sir John Hegarty, founder of the ad agency Bartle Bogle Hegarty (which has created pathbreaking work for brands like Levi’s, Axe deodorant, Johnnie Walker, British Airways and Absolut vodka). If Sorrell is the Maths Man, Hegarty is the Mad Man. Sorrell’s basic argument is that the future of advertising belongs to Maths Men as much as it does to Mad Men, and he points to how technology is revolutionizing the industry. He admits, “Creativity is the beating heart of our business; there is no business without it." But he quickly adds, “It doesn’t belong exclusively to one discipline or another. Imagination, inventiveness, wit, ingenuity and talent are just as at home in media, PR, software development, data and research as they are in art and copy." He also argues, “The definition of creativity needs to change… If you are given some data that helps you understand what the consumer is thinking about in either a practical, psychological or emotional basis then you’re going to come up with more stimulation." 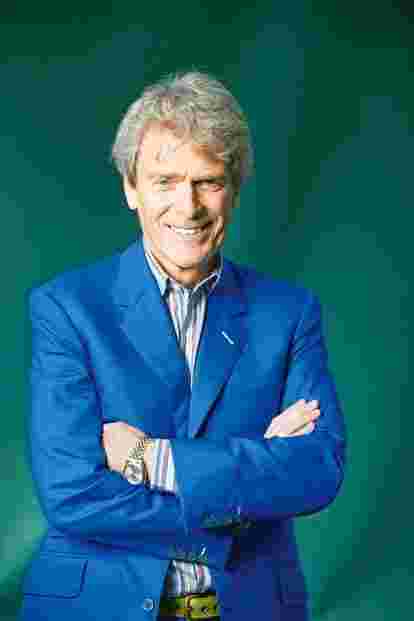 Hegarty has always positioned himself as “the anti-Martin Sorrell". He believes that over-reliance on data is largely to blame for the industry’s problems today—for the mediocrity of today’s brand communications, and for the ultimate decline of the ad agencies in the business food chain. And he therefore advocates a return to the way advertising used to be: the domain of the creative agency rather than the fragmented process it has now become. Sorrell scoffs that you can’t rely on yesterday’s outdated skills to develop effective content for today’s complex world. He calls Hegarty a dinosaur, and jibes: “75% of what we do now, Don Draper (the protagonist of Mad Men)—and maybe even Sir John Hegarty—wouldn’t recognize." Hegarty responds that, yes, of course data is important, but if everybody has equal access to data, the data-driven communication they create becomes undifferentiated, and thus ineffective in building strong brands. And he jibes back at Sorrell: “Some of my best friends are accountants. But I wouldn’t have an accountant running an ad agency." On another occasion, when asked about the most notable thing that happened to him in the past year, he responded acidly, “Being called a dinosaur by Sir Martin Sorrell because I think people are more important than data." This feud is an unfailing source of entertainment for the industry—but beyond the barbed wit, industry professionals take sides, one way or the other. Sorrell’s (typically provocative) current view is, “We are not even in the advertising business any more," pointing out that given the businesses WPP is present in today, from data to research, its competition is not merely the other global advertising groups, but also companies such as Nielsen and GFK, as well as, perhaps, Google, Facebook and Twitter. And in the future, he adds, it might even be firms like Adobe, Salesforce and Accenture. As the old Chinese curse goes, the advertising industry today lives in interesting times—an era that arguably began on 27 June 1987, with Sorrell’s takeover of J Walter Thompson. Anvar Alikhan is a senior advertising professional. The views expressed are personal. The article has been edited to remove the names of two companies that no longer exist and an incorrect comparison of WPP’s revenues.